We’re continuing the great debate of foundations with everything you need to know about a Post Tension Slab. Take a look at Part 1 of our Basics of Building series to learn more about building science and what we do differently from other builders. **If you are looking for a more cost-effective foundation, consider using a Post Tension Slab. In this technique, you eliminate the need for piers with the addition of beams and tension cables that provide extra stability. While many people assume a slab foundation is less stable, the reality is it’s still very secure and is a commonly used technique. We’ve constructed handfuls of homes using this technique. The first step for installing a post tension slab is to remove the original or native soil from the property and replace it with fill dirt. In Texas we have a lot of clay in our soil, which is prone to shifting, contracting or expanding which can cause foundation movement. In order to reduce the risk of movement, we remove the top layer of native soil and replace it with a more stable dirt. From there, we test the soil to ensure it is compacted properly before we start digging beams, typically in a grid pattern, and creating dirt pads. Both the pads and beam trenches are draped in a poly coating creating a protective barrier between the soil and your slab, safeguarding against moisture that can cause soil movement. Rebar and post tension cables are laid throughout providing stability for the slab. 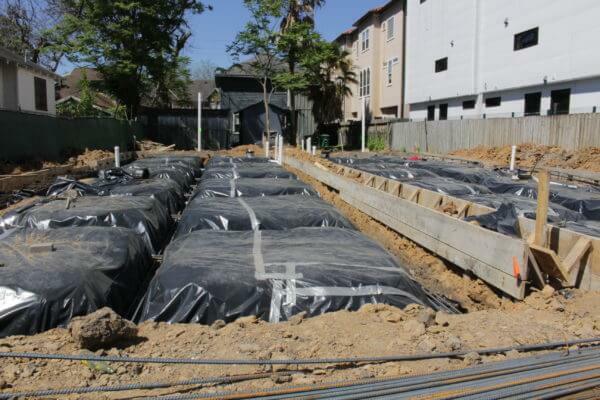 After inspections, your beams and foundation are poured, finished and begin to dry. With a post tension slab, you have to stay off the foundation for a minimum of seven days. After seven days, the cables are stressed tightening the foundation and squeezing any hairline cracks together. Pro: Cost savings is the most common reason people opt for a post-tension slab. Con: You are slightly more susceptible to settling if major soil shifts occur. If you want your handprints in the foundation, make sure it’s in the garage so it doesn’t get covered up. Form boards will form up any necessary drops in the slab for showers, elevators, garage, porch, back patio, etc. that need to be slightly lower than the rest of your flooring.